On this Giving Tuesday, an international day of giving to commemorate the start of the holiday season, I feel especially fortunate and proud, as I reflect on the good work being done by team members across ACT to serve others. ACT’s rich heritage of helping others is evident in so many ways, from volunteerism in our community to philanthropic efforts that benefit areas such as education; social and community improvement; culture and the arts; and disaster relief. Collectively, our team members devoted more than 332 days of the year volunteering for the causes they care about, to help our neighbors and community members in need. Finally, we kicked off our year-long celebration of ACT’s 60th anniversary with a significant education-focused initiative in our hometown of Iowa City. We made a three-year financial commitment to support the Iowa City Community School District’s implementation of the Advancement Via Individual Determination (AVID) program, an innovative classroom-focused initiative designed to improve college readiness for all students, particularly low-income, minority, and first-generation students pursuing higher education. When we give back to our communities, we strengthen the bonds that unite us as human beings. There is no shortage of good causes to give to, or people in need of love, help, and support, but it is encouraging to see the progress that is made and the joy that is spread when we seek to do good together. In 2017, ACT Cares was introduced to create brand ambassadors who inspire and motivate others by promoting a culture of caring for our communities, our customers, one another, and especially, our mission. 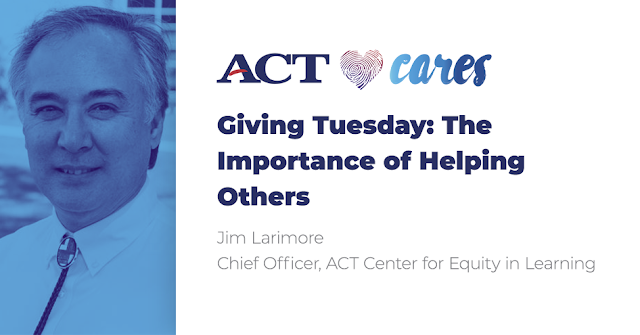 The ACT Cares effort allows us to do more with our dollars, our time, and our commitment to serving the common good. Check out #ACTCares for more inspiring stories and follow Corporate Giving updates on @ACTCareer.